The European Commission has accepted the proposal of the Spanish Ministry of Public Works and Transport to expand the Atlantic and Mediterranean Corridors within the Trans-European Transport Network to include the Spanish ports that were kept beyond the TEN-T so far. These ports are Gijon, La Coruna, Huelva, Las Palmas, Tenerife and Palma de Mallorca, informs the press service of the Spain’s Government. This revision comes within the Wednesday’s proposal of the EC to renew the “Connecting Europe Facility” programme and include into the next long-term EU budget 2021-2027 the investment of EUR 42.3 bln in the European infrastructure networks, of which EUR 30.6 bln is allocated for transport. With the exception of EUR 11.3 bln dedicated to cohesion countries, Spain may opt to receive part of this budget for the development of the efficient and sustainable trans-European transport network. maritime connections with the Canary and Balearic Islands. The TEN-T Corridors are the European main transport arteries, where the major cargo and passenger flows are concentrated. The current extension will benefit the Spanish Autonomous Communities of Navarra, Rioja, Cantabria, Asturias and Galicia, as well as the Canary and Balearic Islands, which overall generate EUR 188,916 mln of GPD, about 17% of the total national GDP, and represent 18% of the country’s population. One of the main beneficiaries of this EU decision will be the port of Huelva, a logistics and industrial hub on the south-western Atlantic coast of Spain, which has claimed the inclusion in the Atlantic Corridor for many years. Jose Luis Ramos, the President of the Port Authority of Huelva, calls this decision “vital for our development”, noting that “the tendency of the port of Huelva towards the import and export traffics, as generators of great added value for its area of influence, both in employment and in wealth, requires this connection to the corridors.” At the same time, “this inclusion in the Atlantic Corridor will contribute to the attraction of new traffic,” added Jose Luis Ramos. 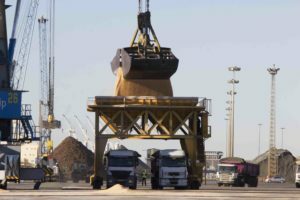 In 2017, the port of Huelva handled 32.3 mln tonnes, up 5.92% to the year 2016 results. The growth is attributed to the strategy of developing intermodality and diversification of cargoes, which led to a sharp increase in container traffic: 57,590 TEU, or +387.14% as compared to the previous year. The container terminal of Huelva is being developed by the Turkish operator Yilport Holding.